Due to environmental demands, car manufacturers now have to use water based paints. Whilst being environmentally safe, they are prone to fading and oxidization. Diamondbrite is made from refined rock oils that are formulated into a 2 stage process so that each product compliments the next and builds up to create a tough durable glaze. The entire process, when carried out by an approved Diamondbrite applicator, is covered by a guarantee* from the date the product is applied. The hard, high gloss protective skin that Diamondbrite creates prevents road salts, traffic film, acid rain, tree sap, insect fluid and other atmospheric pollutants from contacting directly with your cars paintwork. Fading from ultraviolet light is virtually eliminated as is nitrate etching caused by bird droppings (as long as it is washed off within 7 days and treated with Diamondbrite Conserver). To maintain the appearance of the vehicle, simply wash down using the Diamondbrite Car Shampoo. We recommend this is followed by the use of Diamondbrite Conserver (on a monthly basis as a rinse). Both the shampoo and conserver are supplied when the car is Diamondbrited in the first instance. Further supplies of these and other Diamondbrite aftercare products can be obtained from the Diamondbrite Centre or direct from the Diamondbrite Shop (It's worth noting Conserver is used by the world's leading airlines to protect the paint on their aircrafts). 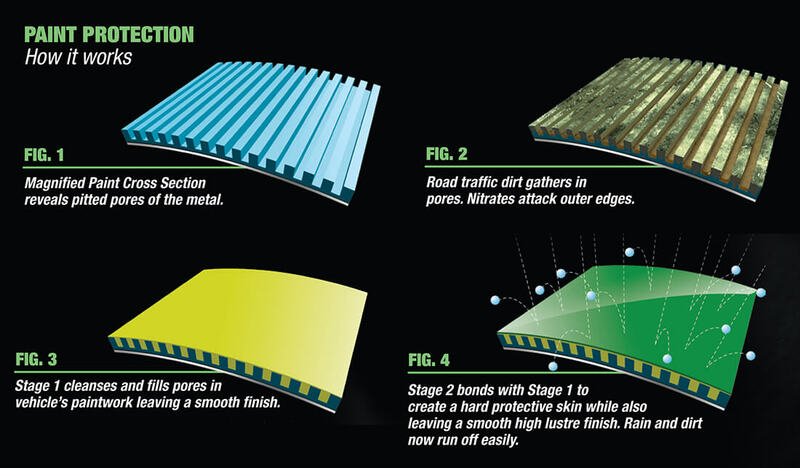 Diamondbrite is a two stage process; the first stage cleans, prepares and adds the initial first stage protection to the painted surface ready for the second stage application. The first uses the Solvent to clean the paintwork of all contaminants, removing any airborne particles, dust, fallout and any pre-delivery wax residues that need to be removed before sealing the paintwork with the Diamondbrite protective film. The second utilises the protection to add the first stage of the protective coating. Stage 1 contains a blend of a hard carnauba with a high melting point that can withstand high ambient temperatures and also be highly polished to give a deep shine, with a soft hydrocarbon that has good lubrication properties to aid the application of the second stage. Stage 1 is a solvent based liquid, containing two different types of hardener. Once applied, the coating is left to adhere to the painted surface, the high polarity molecules become bonded with the surface paintwork. This dries slightly giving an opaque look, but not becoming fully cured, and not being removed until after the second stage is applied. Stage 2 is a blend of high percentage natural chemicals and a high-grade nano ceramic, which leaves a tough yet flexible coating. This product is the concentrated part of the process. It is an O/W (Oil-in-water) emulsion containing the main part of the protective coating and is applied directly onto the semi-cured Stage 1. It combines with the Stage 1, and using polarity it adheres to the top surface of the paintwork. As Stage 2 is applied, the high-grade Ceramic fills and covers all of the minute pits and troughs that are associated with paint finishes and also covers any other blemishes within the surface paintwork, blending it all together. The high polarity chemicals then adhere to the surface, sealing the paintwork and leaving it slippery and smooth to the touch. The finished surface offers Hydrophobic properties that repel everyday dirt & grime and also bead water spray and rain off quickly, with a highly reflective surface to guard against paint fade caused by Ultra Violet rays. The concentrated blend of Carnauba adheres to the paintwork, but also allows the protective coating to expand and contract, in-line with the ambient pressure and temperature. As Carnauba isn?t mineral based it is also more Eco-friendly. Conserver is recommended for use as a monthly top-up onto the already highly protected surface. It is an emulsion containing a very hard protection with a high melting point, and is to be used by the customer in a wash bucket after cleaning the vehicle with a mild Car Shampoo. This product adds a further protective coating, with great hydrophobic protection through continued use. As Conserver also contains a traditional Ceramic it can also be used neat to remove any residual imperfections after application. Jewelultra Ltd believes in continued improvement, and regularly has the Diamondbrite paint protection system independently tested by a well known and respected test house. The results of these independent tests show that Diamondbrite continuously outperforms all of its well-known competitors. Test results are available on request. Independent tests carried out by Intertek Testing & Certification Ltd placed Jewelultra's Diamondbrite paint protection the best performer 2 years running. The tests included water bead height and specular gloss tests on black and red paint finishes (the colour quickest to deteriorate). During the Diamondbrite Fabric Protection process each fibre is coated with an invisible resin based material. After treatment your fabric will be guaranteed against normal everyday spills and stains. Dirt and spillage absorb into untreated fabric leaving stubborn stains and tide marks. No permanent stains. Spills easily removed, dirt vacuumed or wiped away from treated fabric. During the Diamondbrite Professional Fabric Protection process, each fibre is coated with an invisible resin-based material. After treatment, your fabric will be guaranteed against normal everyday spills and stains. Diamondbrite Fabric Protection has been successfully tested with tea, coffee, hot chocolate, alcohol, milk, fruit juices, cola, fizzy drinks, chocolate and grease from foodstuffs. All of these were repelled by the treated fabric and either passed straight through the weave without staining or beaded up allowing an easy wipe away. Carpets take so much abuse that often simple vacuuming isn?t enough. Fabric Protection seals the base and surface fibres to enable dirt and grime including dog hairs to be more easily removed.